Last Wednesday was National Kale Day and Whole Foods Market was having a phenomenal sale -- $5 for 5 bunches of organic green, yummy, fibrous kale. The regular price for a bunch is $2.99, so it was practically a steal. I mean, how could I not walk out of there with 5 bunches? Next question: um, what do I do with 5 bunches of kale before they go bad? My "go-to" kale recipe is a massaged kale salad. It is exactly what it sounds like... you get your hands in there and "massage" the kale, which breaks down the toughness and decreases the bitterness. Seriously, it's amazing. This time I also added broccoli, which is included in the recipe. If you enjoy eating vegetables and salads, than trust me -- you'll love it. If you hold your nose while you painstakingly swallowing your 3-5 daily servings of vegetables, than this one might not be for you. Luckily, I had a lot of kale to work through, so I guarantee there is a kale recipe here for everyone! 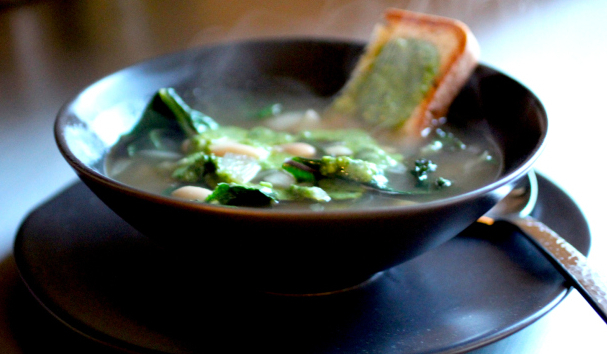 The soup is perfect for the changing weather and this recipe will carry me through the fall and into winter. The massaged kale (which I've made twice in the past week) is a perfect lunch to take to the office. No salad dressing needed and with the healthy faft in the avocado, it's a filling meal. Seriously, try it! Kale chips are "all the rage" and this recipe is super easy and made in the oven -- no dehydrator needed. The fourth recipe is one that I'll make tomorrow night, using the final bunch of kale, for my pre-Baltimore Running Festival meal where I'm running the Half Marathon. 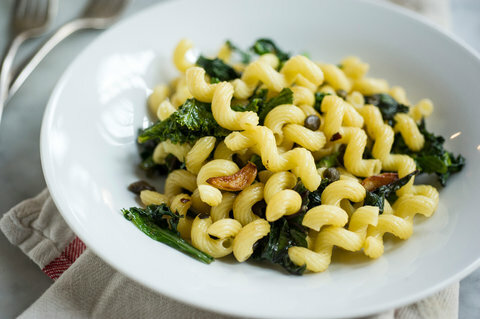 I'll swap out the whole grain pasta for my new favorite, Quinoa Pasta and hold the cheese and anchovies, but I have the ingredients in my kitchen and ready to prepare this delicious looking and relatively quick to prepare meal. Let me know which one you try and which one is your favorite. Have I missed your favorite kale recipe? Share it in the comments below.